The red poppy is an internationally recognized symbol of remembrance for veteran sacrifice. Each seed packet sparks awareness and conversation about the WW1 Centennial as it honors the legacy of the 4.7 million American veterans that served during World War I. The red poppy is the recognized symbol for veteran remembrance because of poem “In Flanders Fields” by John McCrae. 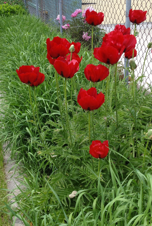 Mid-May is the perfect time in our area to plant poppy flower seeds since the danger of frost has abated. The seeds are Flanders poppy (Papaver Rhoeas), derived from the wild poppy of Flanders fields, and Shirley poppies, a strain of the same species, are annuals which can be sown as the last snows melt, for bloom in June and July. Please come by either the Jackson or Swain Extension Centers to purchase a packet of these Flanders poppy seeds for $2.00 to show your patriotic spirit in memory to those whom served in WW I. Contact Robert Hawk for more information at 586-4009 or 488-3848. The poppies should grow well in our counties. Your packet contains 100mg of really small seeds. After danger of frost is over, prepare some soil. Plant the seeds 1/8″ deep. After they sprout, thin the plants 1 foot apart.